The Museum of Art on the Sea (MAM), located on the beautiful south pier of the city, is a permanent open-air exhibit of contemporary works of art, with an impressive display of 135 sculptures and 10 wall paintings. 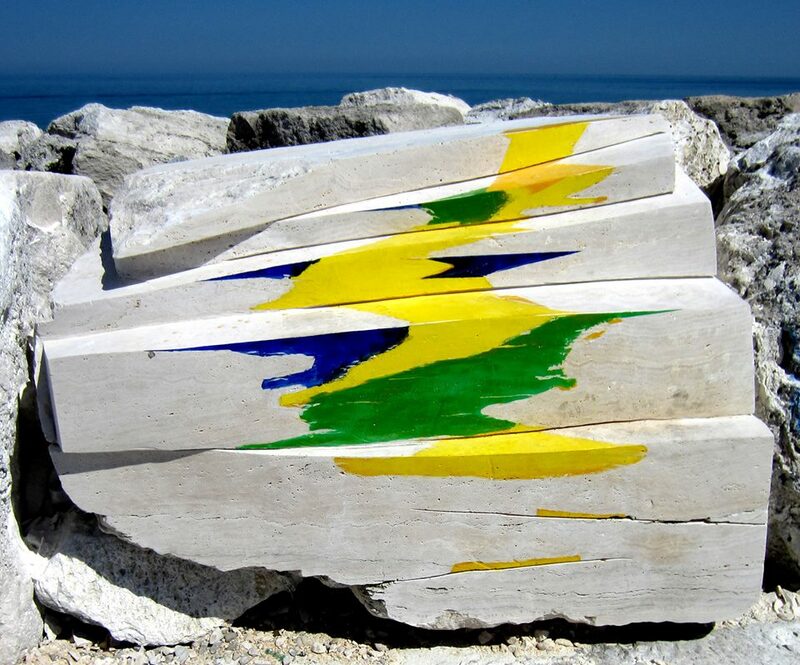 The artworks, signed by more than 130 different artists coming from every corner of the country and from all over the world, were created during the past editions of the “Scultura Viva” (Living Sculpture) International Sculpture and Painting Symposium, held in San Benedetto since 1997. Works by Mario Lupo, Marcello Sgattoni, Genti Tavanxhiu and Giuseppe Straccia are also exhibited on the pier. Commissioned by “Circolo dei Sambenedettesi”, a local association for the conservation of the city’s cultural heritage, and completed in year 1986, a monument by Mario Lupo proudly stands as the biggest piece in the exhibition: an eight metres high bronze sculpture dedicated to Jonathan Livingston Seagull. During the restless years which followed the end of the seventies, the city was troubled by youth distress and unrest. The sculpture was therefore conceived as a positive message to the youth: an invitation to escape the logic of the group and gain their freedom through individual commitment, by devoting themselves to build a better future. Jonathan Livingstone Seagull, the main character of a novel by Richard Bach titled after the bird’s name, was chosen not only as a model of independent thinking, but also as a symbol of freedom itself. With its airy lightness, the monument delights both tourists and residents alike, relieving them of all their heavy thoughts and making them fly high over the humdrum of everyday life. Another interesting monumental sculpture is the work of Albanian artist Genti Tavanxhiu, made in year 2006 and dedicated to Mons. Francesco Sciocchetti (1863-1946), a key figure in the development of the city. “The fishermen’s priest”, as he liked to call himself, Mons. Sciocchetti devoted his life to the improvement of the fishermen’s life quality. He established courses for young boys, to teach them the crafts of the sea, and a sewing and embroidery school for the girls. He also supported the creation of the first motorboat ever launched in Italy, a vessel named “S. Marco” which was used to carry the fish caught by other boats to the shore. An innovation entailing significant consequences: the motor vessel improved the quality and freshness of the fish, as the market could be reached faster, and it relieved the fishermen of the risks taken in performing the same task on their sailboats. The new propulsion technology was then applied to fishing boats, in San Benedetto and all over the country, resulting in deep changes for the fishing industry. 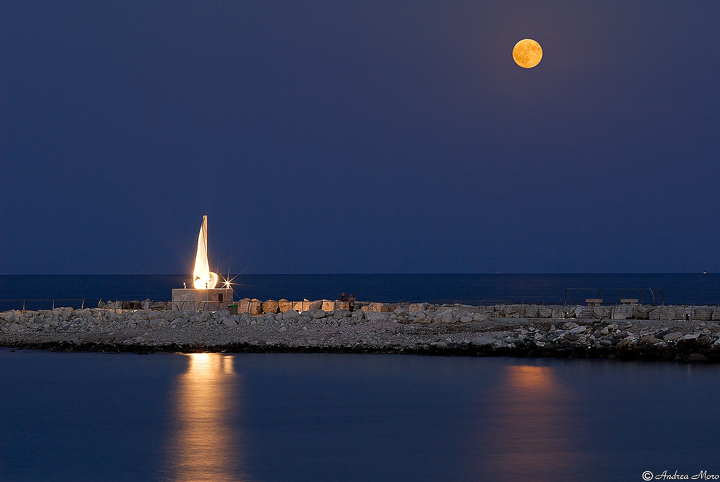 The monument by Genti Tavanxhiu, entirely made in Ascoli travertine stone, represents a sailboat equipped with a big turbine. After the nightfall, thanks to artful illumination, the sculpture transforms: its sail looks like a huge alabaster wing shining in the dark sky. Walking further down the pier, visitors will encounter a statue of the Virgin Mary gazing out into the sea, the work of local artist Giuseppe Straccia, who also created one of the Museum’s most curious artworks: a sculptural group representing a nativity scene, which is located underwater, right at the feet of the Virgin Mary statue, barely visible even when the water is clear. On the surface of the water, a bas-relief titled “Madonna del Mare” (Our Lady of the Sea) pays homage to the victims of the sea. Visiting the Museum of Art on the Sea is a really unique experience, not only because of its exhibit, but also thanks to its beautiful setting: a graceful promenade stretching out into the open sea, for a length of over one kilometre. 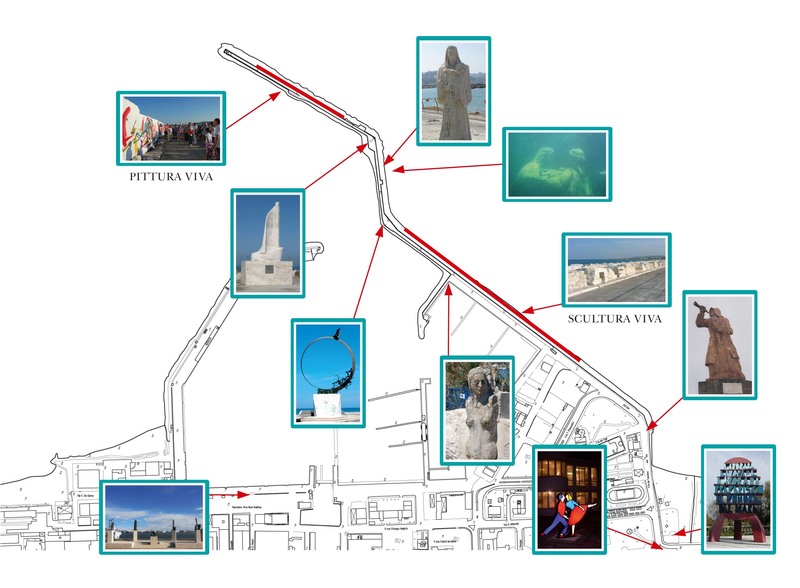 The first half of the walk is dedicated to sculpture, showcasing bas-reliefs, high reliefs and sculptures in the round, created by the artists who took part in the “Scultura Viva” International Symposium and carved on the travertine stone blocks acting as a breakwater on one side of the pier. On the opposite side, one single and bizarre artwork can be found, the creation of local artist Marcello Sgattoni: a fountain made of concrete and river pebbles representing a girl from whose breasts drinking water flows, a celebration of water as the source of all life. The second half of the walk is dedicated to street art painting. On the huge concrete blocks fringing the final stretch of the pier, 10 wonderful murals were painted by renowned artists from all over the world. The Museum of Art on the Sea is always open and free to visit at any time.